When Hillary Clinton signed on to speak at the Bronx Children's Museum "Dream Big" event, she probably had an inkling of what she was getting herself into. But did Clinton realize just how strong her elementary school-age voter base was? On Friday, Hillary Clinton was swarmed by adoring kids, receiving hugs, warm wishes and big smiles. It set up a nice change of pace for the former secretary of state, who has been appearing at colleges, independent bookstores and Silicon Valley offices over the last two months to promote her latest autobiography, Hard Choices. 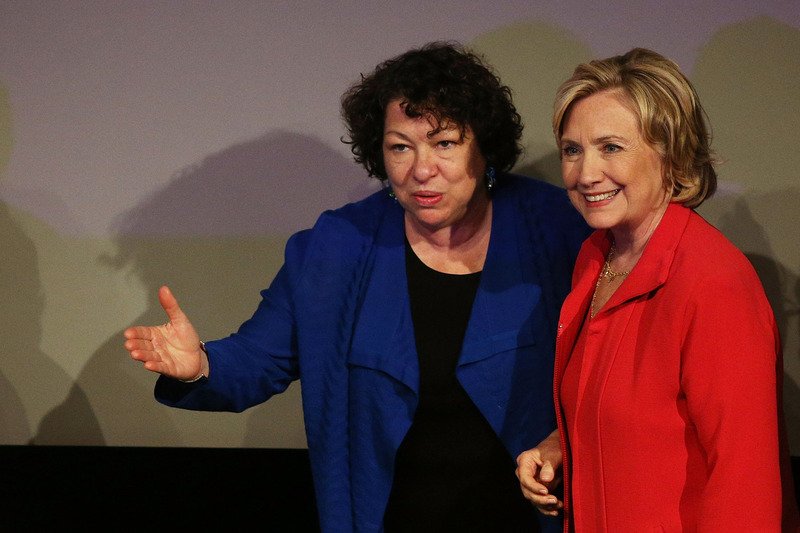 When it was her turn to speak, Sotomayor rallied up the kids. "Go hug these famous people and tell them, 'Thank you,'" Sotomayor said, surrounded onstage by the children. And hug them, they did — especially Clinton. According to The New York Observer, Clinton was "the clear favorite of the children." Though "Dream Big" was a children's event, there was talk of politics — as is typically the case when Hillary Clinton is involved. Some of the event's speakers made some light jabs at Clinton's possible 2016 presidential run, including Bronx Borough President Ruben Diaz Jr.
"It is never ever too late to continue to dream big," Mr. Diaz said, as quoted by The New York Observer. "Even if you are an expecting grandma, you can dream to be president of the United States — right, Hillary?" Clinton's response was lighthearted and coy. She reportedly stood up, smiled and waved at the audience, but unfortunately, no presidential candidacy announcements were made. Maybe we'll just have to wait until her next appearance on The Daily Show. Clinton has been appealing to a wide range of audiences — and potential voter bases — this summer, though her most recent appearance at the Big Dream! event may be her most unusual, as well as refreshing. It seems true, though, that kids may be Clinton's strongest fan base: Just a day after her Bronx appearance, Clinton had a glowing admirer in an 11-year-old girl at a book signing at Sam's Club in Seekonk, Massachusetts. "I said, ‘I’m ready, are you?’" the 11-year-old told local media. Clinton responded with a high five. As her Hard Choices book tour is winding down, it's time to turn toward 2016 and the prospect of Clinton as a viable presidential candidate. Is she one, and did this book tour work in her favor? According to former State Department official Anne-Marie Slaughter, it's a toss-up. "From my perspective, the chief lesson of the 2014 tour for 2016 is that it is very hard to write a book about being secretary of state for a press audience that is primarily interested in whether you will be president," Slaughter told Politico Magazine.